I hope to write more about gardening in the future. What I've done so far has been for my friend Karen Bojar, a wonderful gardener, who has a blog called The Next Stage: Women in Retirement. I have contributed some of my thoughts on gardening to her blog and she has kindly given me permission to include them here. My first serious gardening took place in a tiny plot behind our rented apartment. It didn't allow for much scope but gave me a place to practice gardening. When we bought our house in Cambridge, MA, room for a garden was essential and we managed to get a place two house lots big. The yard, however, was a disaster. As I was looking at it and deliberating over where to begin, my friend and contractor came up and said, "You know what this yard needs?" "What?" "An old car on cement blocks." He was right, that was the condition of the yard. The back yard is now pretty much the way I want it)lawn, ferns, trees (a birch, a redbud, a crabapple), clematis gone wild, phlox, beach plums and grape vines (for jelly)no longer suitable for an old car on cement blocks. One of my many first projects, and one with which I am particularly pleased, was the narrow path on the north side of the house. It was overgrown with tangles of tall weeds. There was scraggly grass down the middle, impossible to mow because of limited space, sharing the path with moss. I finally decided that I would get rid of the grass and encourage the moss. It took a few years of weeding the moss of grassfortunately I find weeding relaxing and rewardingbut now the path needs only minimal work. The heat has been hard on it this year, and I'm always walking on it, but rainand an occasional application of sour milkeventually brings it back. The Concord grapevine grew from cuttings from a vine in the back yard that I threw on the north side to compost and then forgot about. Neglect can be a wonderful friend. The vine now has its own arched trellis and provides even more grapes for jelly. It fights with the wisteria but with pitiless pruning both behave themselves. And the ferns need little care, just an occasional curb to their enthusiasm. I've never seen chaos in Karen's garden, just lush abundance. Unlike Karen, however, who "wants to pack in as many plants as possible", I think of myself as a minimalist. I like lots of green, even if the dogs playing means that I never have quite as much lawn as I'd like. Fortunately the volunteers (phlox, petunias, andlucky meclematis) in the back and front yards work to counteract my somewhat bland inclinations. What has been most useful to me as I garden on in my 60s? A chiropractor, a homeopath, 3 days a week at the gym, a battery-operated lawnmower, a kneeling pad, sharp pruning sheers, and a realization that I'll always be running behind and that's ok. 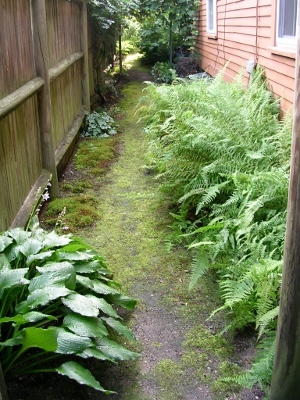 I never had the ambitious garden that Karen had so I've stayed with some flowers but lots of greengrass, ferns, moss. I still do some things the old way (in line with my still drying clothes on a line instead of in a dryer). My current project is hand-weeding the lawnlabor intensive but very rewarding. I thought it might be a crazy thing to do, but my arborist, who is in his 80s, said that's how they always did it in the old days. No weed killer and lots of compost if I get to the weeds before they seed. It's been 36 years now and I'm still hoping to get caught up. Every year I fall short of what I hope to accomplish. Still, when I sit in the yard in the morning with my coffee I try to refuse the impulse to take stock of what needs doing and appreciate what's thriving. I'll try to take Karen's advice: accept imperfection. What I find most discouraging about being an "aging gardener" is that my body can't work as long as my mind wants to. I have to pace myselfsomething I'm not very good at. I find it frustrating that I can't keep up with projects and tend to forget that with gardening one is always behind anyway. My approach this spring is to focus on cleaning areas just before things are coming into bloom. Unfortunately the forsythia beat me and are now blooming in a patch of fall leavesI never get to that area on time! 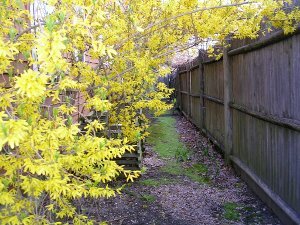 My current tasks have been to prune the kerria of dead wood before the flowers open (just made it) and to make sure that the many clematis, which love my yard and reseed freely, all have support so they will climb the stockade fence. I always find working with clematis fussy. They transplant easily for me, in part because it was only recently that I learned one needs to be careful and I just dug holes for them and stuck them ina process that worked remarkably well. The fussy part is being sure that the stems of the old ones have sufficient support without my breaking them. They require the softness of a hand that holds a baby bird. With all the past wild weather the ground is covered with sticks, mostly from the birch treemy mother warned me that it is a messy tree, but I love it nonetheless, sticks and all. I save some sticks to use as kindling in my wood stove, but the rest has to go in the yard waste bags for the city to pick up. I'm envious of those people who put out 10-15 yard waste bags at one time when I only have the energy to fill a few. Of course I compost a lot, but I still end up feeling like a wimp with my two bags. Now that the weather is good, I can put extra house plants out on the sidewalk for passersby to take. (I feel a moral compulsion to root everything that breaks off even though I have no room for more plants.) I also put out things I have to clear from the yard)raspberry seedlings that have run amok, pachysandra from the neighbor's yard that strays into mine (for some reason I hate pachysandra), invasive bee balm, and other odds and ends. Whatever I put out is taken (I hide them when trash is collected), which I find very rewarding. The best retirement days for me are writing in the morning, gardening in the afternoon, and reading in the evenings. I've been having a lot of best days lately. I think of the winter garden as the place for stock-taking. The "bones" of the garden are evident and I, thanks to retirement, have the leisure to reconsider, regroup, and plan. This year I'll try to do more with autumn flowers. I'm also looking for a good groundcover for a bank where the dogs runplants that are low-growing, very hardy, and willing to spread. The ground phlox hasn't been entirely satisfactory, but maybe more of it would work better. I always want something in bloom throughout the year but am far less successful than Karen. Maybe next year. Time to check out plant sites on the web. Of course, a lot of what I see now is jobs that I should have done alreadytie up the broom so it doesn't get beaten down by the snow, prune here and there, do any odd job that cold and rain and snow will allow. And leaves always remain. Nonetheless, it is rather peaceful since there really isn't all that much that I can physically do, but I can dream. And when snow comes it covers up all the problems and everything looks beautiful. Like Karen, people ask me if I would prefer living where I could have a year-round garden and, like Karen, I prefer (actually need) the varied seasons. Seasonal change and weather are very important to me. I love the drama of storms and the comfort of warm sunny days. When spring comes, I really feel that I've earned it by surviving winter. A friend, a fellow New Englander, moved for a time to California and said she didn't know how Californians developed any personality without weather to contend with! I also think that without the winter break from gardening I wouldn't have that pause that makes gardening something to really look forward to. 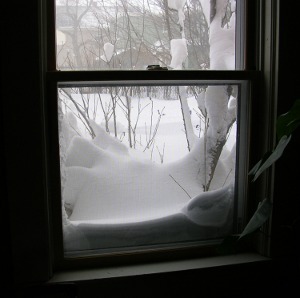 I await the snowdrops and crocuses as the first sign that, once again, spring will really come. Reading gardening books in the winter is a special pleasure for me. I plan such wonderful gardens, even if they are only very partially realized. At the moment I'm reading Olive Pitkin, My Garden and I: The Making of a Mid-Life Gardener (1992). I prefer narratives like this one to "how-to" books. Pitkin does most of the gardening herself (aided by relatives and friends), which I admire. I can't really identify with gardeners whose work is done primarily by others. I also can't identify with those who seem to have unlimited resources. When the famous gardener Christopher Lloyd was laying in a garden on an estate, a road was in the way of what he planned so the owners had the road moved. That's a bit more ambitious than I can manage. I'm content with my little city plot of ground in all the seasons that it passes through. Some weeks ago I emailed Karen to tell her that my book is done and my garden is a mess. She said that should be a title of a post so here it is, Karen. As you'll notice, the photos are close-ups because any broader view would seem to be of an abandoned lot. But first, to my book. In April I got a contract from University Press of America for a book I'd completed called The New Orleans Sniper: A Phenomenological Case Study of Constituting the Other, due out in December. As the title suggests, it is not destined to be a million seller, but it does have a niche in phenomenology, sociology, and criminal justice. UPA publishes scholarly books with small runs and thus asks authors to provide camera-ready copy. It's possible to hire someone to produce such copy, but, hey, I'm retired and can do it myself. I did not, however, entirely understand what I was undertaking. Fortunately, very fortunately, I enjoy detail work, but it ended up being a rather complicated job. I learned more about formatting that I was aware there was to know. Fortunately UPA provided great support and the book is now in their hands. So from April to August I spent most of my time revising, formatting, getting permissions, and doing a hundred necessary bits and pieces. There is no way I can catch up with all there is to be done in the yard so I'm doing my best to deal with the things that are most offensive to me. The weather has produced many of these things: trees have been losing leaves (it looks like autumn), plants have died, the grass is brown (no amount of watering seems to help with days at 90 degrees), and the weeds have run amok. Some things have done well, too well: in my narrow north side moss path the hydrangea has gotten so big that it hits me when I walk by and if I swerve to the other side I get hit by Concord grapes. 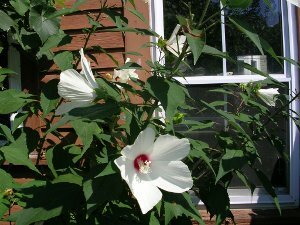 The Rose of Sharon has had a spectacular year and a wild red rose has been blooming non-stop. But all this is happening surrounded by weeds so nothing looks as pretty as it should. I do find weeding peaceful so my main goal is to pull as many weeds as I can before they reseed, do lots of pruning, and look to next year, when my garden will be immaculate. 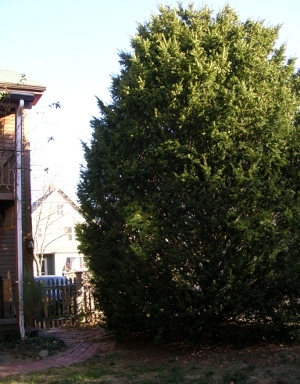 When I was a teenager, my mother discovered the yew tree (pictured above) behind her garage. 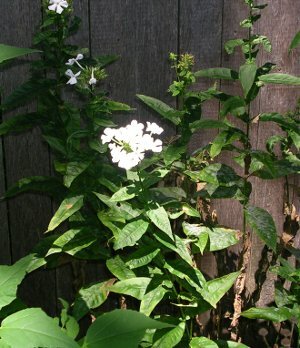 It was about a foot tall and with two short branchesnot particularly impressivebut my mother fell in love with it. I moved it to a patch in front of her dining room window where it thrived and grew to about 4 feet. When my husband and I bought a two-family house with my mother, I dug up her tree to bring with us. It was quite an adventure. The taproot went down forever and I only managed to get most of it out with a friendly workman in the adjoining schoolyard (who, unfortunately, got in trouble with his boss). Because of a snag, passing papers on our house was delayed for three months so the tree languished in burlap through the autumn into the winter. I finally planted it in December and was not optimistic but, as can be seen, it thrived. As I walk through my garden, I have many fond reminders of others. The forsythia are from my mother's yardthey were always her favorite. The crabapple tree (Alex and Frances) and rugosa rose (Peter and Susie) were housewarming gifts. The clump birch was a silver anniversary present from Jerry, Hannah, and Jimit was supposed to be a silver birch, but the clump birch seemed a better choice for us. The dogwood is from Marjie. The kerria in the front garden is a gift from Denise; it came along with a bit of periwinkle that now covers the patch around the kerria. The asters are an indirect gift from Denise: she gave some to Assim who, when they spread too wildly, passed some on to me. The coral bells and sweet woodruff came from Peg. I had purple violets, Mary Ellen had white: now we each have both. My two-story high white rose (pictured above) as well as my red rose came from my friend at the garden center, who gave them to me one spring because, as he said, "They look too bad to sell, but I'm sure they'll grow for you." And they did. 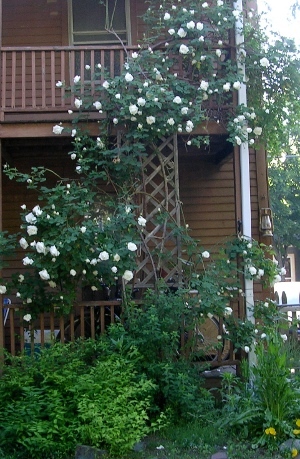 (After I planted the white rose, and it was established and 5 feet tall, I realized that it was growing outward instead of inward against the porch where I wanted it. At what at the time I thought of as a bit of madness, I dug it up and turned it around. Despite my fears, it thrived.) 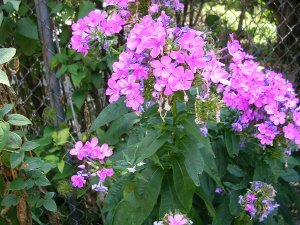 And, of course, the purple phlox (and a stray white one) came from Karen, who always comments on how well they like my yard. 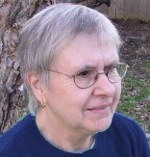 Karen's post titled "The Stars of My May Garden" led me, as her garden posts often do, to contemplate my own gardening experiencesas well as to admire hers. I have recently been struck with how the highs and lows in my garden follow in rapid succession, if not simultaneously. 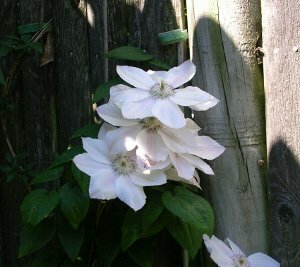 A high followed by a low: In preparation for the blooming of my many clematis this year, I moved some outliers. Years ago, before I knew that clematis were fussy, I just dug them up with only minimal care and moved them and they thrived. Now I continue the process, ignoring all the advice about how careful one needs to be, and it works. This spring I moved three plants that were five feet tall and a number of other smaller ones that were growing where they didn't really belongamong the raspberry bushes or lolling on the ground without support. 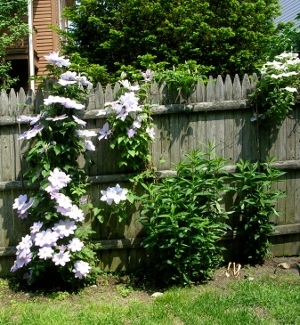 They all did well and bloomed, but for some unexplained reason three other old clematis simply diedhealthy one day and dead the next. 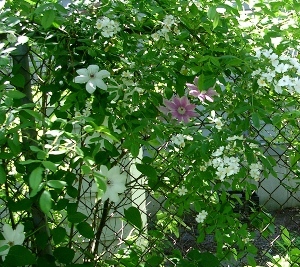 A surprise: I read that clematis look pretty twining in a rose bush. I couldn't quite imagine it so never tried, but the clematis and the wild rose took matters into their own hands. I'm very pleased with the effect. Another surprise: In my little front yard and with a quick glance, I thought the lilacs were really spreading and had produced white ones as well as purple. 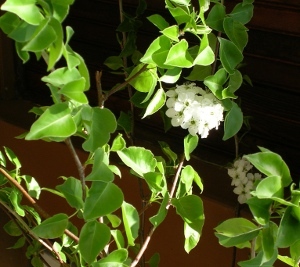 On closer investigation I realized that the white blooms were not lilacs at all. I sent a picture to Karen, who said they looked like apple blossoms, but the landscaper who came by said the plant looked like a pear tree. How did I get a pear tree? And, more important, what will I do with it? It's very pretty and so far is not interfering with the lilacsthey seem quite happy together. I think I'll wait to see if I get edible fruit before deciding whether or not it should come down. And that way I'll at least know from the fruit what it is that I have. 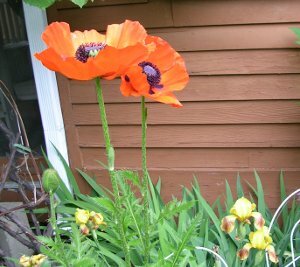 A low followed by a high: A few years ago I got three mail order poppy plants. Two died. I notified the company and then sent me three replacements. Two of them died and one is languishing. But the third one is worth all the previous problems. The flowers last for only a brief time, but they keep coming and are astonishing. So I live with the lows, cherish the highs, and enjoy the surprises. With this year's warm spring, I got an early start on yard work. I was optimistic that this year I would be able to keep up and have the best garden ever. Alas, it was not to be. May and June were taken up with finishing a book I edited with a friend of mine—a fully enjoyable project, but the amount of intense work involved limited my time in the garden. And then, in June, I had cataract surgery, after which I was not supposed to bend over or lift anything heavy for two weeks, so all I could manage was the little light pruning that could be done standing up. When I finally had more free time to devote to gardening, the weather scuttled my plans, with alternations of heat in the 90s and days of torrential rain, both of which kept me inside. The odd weather was responsible for a number of disappointments. 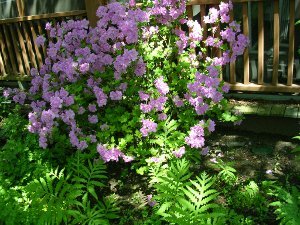 The lilacs, which reliably bloom around Mothers' Day, had a very short season and were gone by the holiday. Clematis came and went with equal dispatch, as did the roses. The red roses, fortunately, rallied and gave a second show (despite the fact that their trellis fell down and had to be nailed back to the house, a task that involved many painful scratches from thorns). The June white roses were also short lived, but for some reason just last week decided that they owed me a second blooming, offering me both encouragement and pleasure. Strawberries and raspberries, however, produced almost no berries. The purple Concord and green grapes look good but don't yet seem to have gotten the kind of weather that will make them sweet. I finally identified the hateful vine that has been invading my yard for the past few years—swallow wart—and I have been on a mission to exterminate it. Apparently I am not the only one, for in my city and adjoining ones there are actually "vigilante" groups bent on its destruction. People walk through neighborhoods, talk to neighbors, and collect what pods they can that are in public places. Interestingly, we are told not to compost the pods and not to put them in the trash. The only suggestion is to burn them, but to the best of my knowledge burning them outside is illegal. I'm not sure what one is supposed to do with them—all I have come up with is putting them in plastic bags in the trash and feeling guilty. So, in preparation for the wonderful garden I will have next year, I have started madly weeding, pruning, taking stock, and making plans. I'm cleaning up the strawberry and raspberry beds. I'm encouraging a shaded area with sparse grass and a moderate amount of moss by pulling up the straggly grass and transplanting moss that is growing is less desirable locations such as the strawberry bed. I'll let the grass and moss decide on the dividing line between them and support their decision. It's been a wonderful year for ferns, with the consequence that they are overspreading a north side path so I am cutting back where I can. When they die back, I'll go to work with my edger, define their limits, and dig up those that have spilled beyond their boundaries. There is a certain perversity in the fact that plants that don't do well and those that do too well are both problems!